How do I sync my timeline on Twitterrific across different platforms? 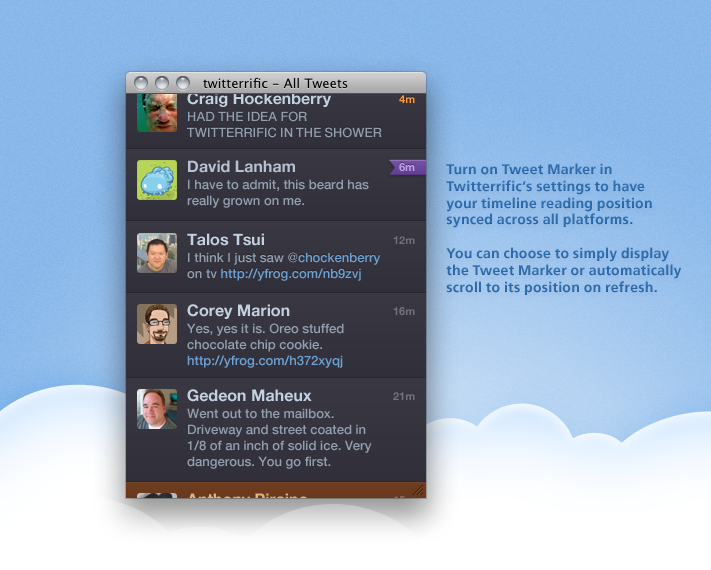 Twitterrific can use either Tweet Marker or iCloud to sync your timeline position. Whenever you switch away from viewing your timeline - such as when you change focus to a different app, switch to a different timeline, or quit Twitterrific - Twitterrific will mark the topmost visible tweet as your current position and send that location to Tweet Marker/iCloud. Next time you launch or bring Twitterrific into focus on any platform, the app will restore your saved position, so you can start reading right where you left off. To make use of timeline syncing on Mac, open Twitterrific's preferences by going to Twitterrific > Preferences in the menu bar. There under the General tab you can set the settings for Sync Reading Position to either iCloud or Tweet Marker and either "Show Marker" or "Scroll to Marker". To enable timeline syncing on iOS, open Twitterrific's in-app settings from the sidebar. From there, you can open the Timeline Sync section, where you'll be able to choose how you want timeline syncing to behave and whether you want to sync using Tweet Marker or iCloud. The "Show Marker" setting will place a purple ribbon marker on the tweet that was saved as your current position, but will not change your timeline position. NOTE: For syncing reading position to work correctly it is critical that all devices and platforms running Twitterrific are set to use the same service. If they are not, the marker won't be read by one of the devices and proper auto-scrolling cannot occur.